The photo id for this photograph is 1626, in the Whaley Bridge L-S album. Years ago there were many pubs in Horwich End and 4 very close at the Chapel Road/Old Road junction. These were The Partington Liberal Club now the Gospel Hall, The Quiet Woman now a terraced cottage, The New Inn now Nimbus Antiques and The Seven Stars now Nimbus Antiques' workshop. The last landlord at The Seven Stars was William Celandine Jodrell and he left to go and fight in World War 1. He was killed in action aged 42 in Belgium and is buried in La Clytte Cemetry in Belgium I have visited his grave. When he failed to return sometime after the War The Seven Stars became home to Whaley Bridge Brass Band. 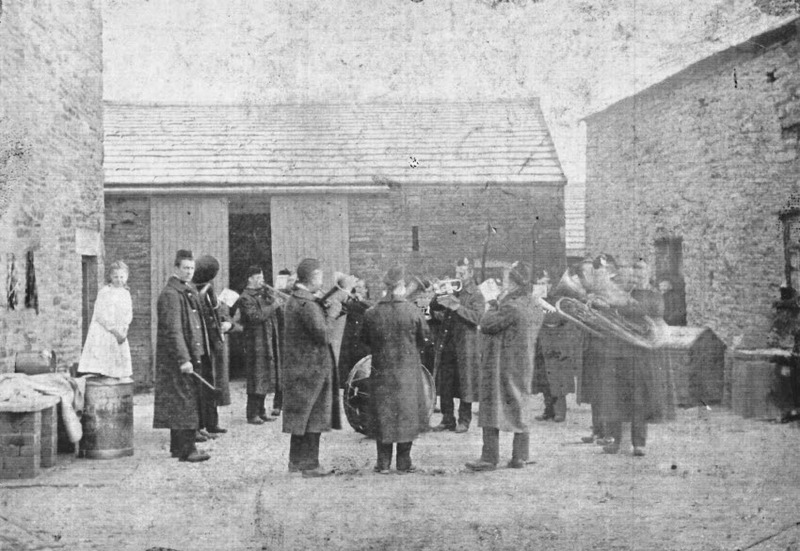 So I suspect they were probably in occupation around 1920 and they used to go out on Christmas Day playing Carols at the local farms I don't know what was special about the farms in those days but that was what I was told the Band did. So I would date this photo, and a good one it is too, at sometime around the early 20's. Great photo, by the way. Couldn't have been too cold as the child on the left isn't even wearing a cardi ! Do you know what Gnats? When my dear old friend Peter Jodrell died his daughter Alison organised the wake at the White Horse in Horwich End. It was surprising because when her mum died a few years previously the do was at the Shady Oak. Much more fitting. I asked Alison why she had chosen the White Horse and she told me it was in memory of Peter's grandfather who was once the landlord there. When I told her Pete's granddad was landlord of the Seven Stars she was speechless and said she had never even heard of a pub called the Seven Stars. Thinking back I probably should have kept my trap shut.